We remain on city sidewalks – if possible, the same one as last week – but now we explore the sense of smell… the deadline for this theme is midnight Pacific Time, Sunday 09 December 2018.
wonderful! thank you poets for supporting each other with kind words, & for submitting! Another fine collection, Kathy. Just the right thing for a frigid night indoors – a fire, hot chocolate, and haiku! Thank you! And congratulations to everyone whose work was selected! For me, the single word ‘fussy’ enlivens everything in your haiku, Erin. Also like the well put  ‘dumpster lip.’  Cheers. Congrats to all the haiku people. Thank you, Kathy, for publishing my poem. 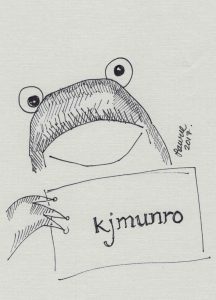 Thanks Kj Munro for such an awsome  oficina our different está of witnesses  the Worlds.Thanks for having selected my haiku. Thanks to every contribuir who enriches my senses  sharing them. Thank You Kathy for the selection, makes one read,think ,introspect.The overwhelming reality of urban life is in all its facets is vast, varied across various cultures,the selection provides this cross sectional glimpse. The words are poignant, depicts helplessness, sense of being alone in a crowd of purpose driven populace. Grandpa could also wear a mobile phone with a headset, talking to…? Thats why I like this haiku so much! Kathy, thank-you for publishing my haiku. These haiku remind us that a sidewalk represents  so much more than rushing from point A to point B. Thanks for the excellent topic and selections, and for including mine. Thank you Kathy for accepting my contribution. Thanks, Kathy and poets, for this fascinating sampling of sound. Even in noisy downtown areas, one can experience silent moments of connection. arvinder’s “the silent eloquence” and Debbi’s “sidewalk cafe” capture this beautifully. The feel of separation from the hubbub as you focus on some emanation from nature. Nice bit of subtle humor from arvinder as well. I know I have been honked at when I lost myself staring at the sunset. Nice work all around. Have a great week, everyone! An intriguing take, Craig, “separation from the hubbub” something  I frequently desire..
when “staring at a sunset.”. Both of you seem to have something of the contemplative in yourselves. Thanks Kathy for selecting these haiku and for including mine! Christine Eales’s is a great take on our multilingual cities. Really “heard” that one too. And Deborah Kolodji’s I particularly liked as well. Well done everyone for a great batch and many thanks, as ever, to Kathy! Thank you kj. Your work on this is so much appreciated. Congratulations to everyone included. I look forward to this each week. Thank you kj. Your work on this is so much appreciated. Congratulations to everyone included. Hi Kathy,   I like the way you asked us to think of the selected poems as ones that echo. Here’s what I heard in the echoes of two featured poems. Roberta Beary’s “hopscotch”  brought me back to simpler times when moms stayed home and sidewalks were safe and clean. There were so many sidewalk games in the past! Then, Christine Eales’s “busy street in Paris”  could refer to any of the popular city destinations where many of the locals stay away from the “touristy” streets. Of course, the shopkeepers must be multi-lingual to understand all the foreigners who spend their money there! I also thought of my home city of Boston where you didn’t hear much English being spoken in the many ethnic neighborhoods. A few words about one of the poems from the rest of the column. Aalix Roake’s “nighttime city stroll” made me think of a walker who was very brave to be out alone on a city street at night, and was faced with a fear that she/he was being pursued from behind. Could it be a purse-snatcher?, Maybe, though,  the walker sped up simply to avoid being bumped into. Maybe the follower was just a jogger who would have whizzed past without incident. Another marvellous selection, Kathy, well done to all poets. This just sends shivers down the spine. A nice bit of unease with this one. It never fails to amaze me the wonderful words people come out with, and don’t even realise it. This made me smile as its a case of ‘guilty as charged’ I just cant help myself. Lovely work. I practiced this frequently in Paris and knew my French was improving when I could follow the conversations of those seated nearby. I called it a “learning experience”. I haven’t yet had a chance to read all these great pieces  – but hope to today! Thanks for mentioning my poem. You did not have one but still took the time to enjoy the others. A fine testament to the value of this weekly exercise! Thank you Kathy and to everyone who contributes,  I so enjoy reading these each week! 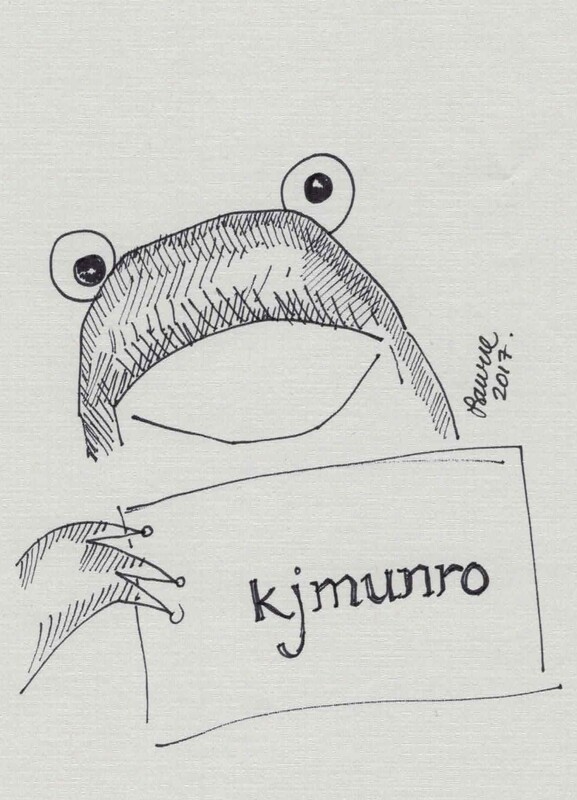 Great selections by KJ Munro. Thanks as always for what must be considerable work on this and for giving us (many of whom are novice) a chance to share. For me it was my mother’s yell from down the block for dinner, but the emotion is the same. Barbara Tate’s “squeak of last night’s snow” took me back to a late late walk in NYC when the city was mostly asleep. There are some great senryu in this collection (methinks)… so many little points of humanity. I smiled broadly at Susan Roger’s “remembering Gene Kelly in the rain I start to hum” having just recently watched my 10 year old belt out that iconic verse on a wet day. Thank you so much for mentioning my poem. So much appreciated. I just printed this issue out and look forward to an evening of good reading. I used to live in Ohio and definitely miss the squeak of snow!! Wonderful read today!Thankful to have my haiku among so many different verses. I find that I am visiting many different sidewalks and learning so much. Such vivid imagery and depiction of the sense of hearing. A few ku that popped out at me today. Lots of different noises from songs to bird songs, horns honking,jackhammers  and much more. I can hear the stop and start of the birdsong and jack hammer or maybe it is just the jackhammer noise masks the birdsong both harmonious in their own way and of course depicts the human and natural made noises one hears often when out on a sidewalk. “singing in the rain”  what a wonderful image that you have brought to life and a song that replays in my mind the minute I read your haiku Susan! Again thank you and congrats to all! What another wonderful collection of haiku! Thanks for including one of mine in this virtual world tour of the sounds of the sidewalks. What a great way to travel…all these images in my head to savor throughout the week. which not only conjures up a poignant vision but also a soundtrack to go with it. encouragement  takes us a long way. Dear  Kathy, warm greetings! So many vibrant voices, we could hear and enjoy,  so many approaches. Always bow before your meticulous care. Delighted to see mine,thanks for including the same. Of  many wonderful haiku, this one is my immediate . Thanks to KJ and all contributors–a wonderful aural tour of world cities. Never been to Paris, but could hear and see it!